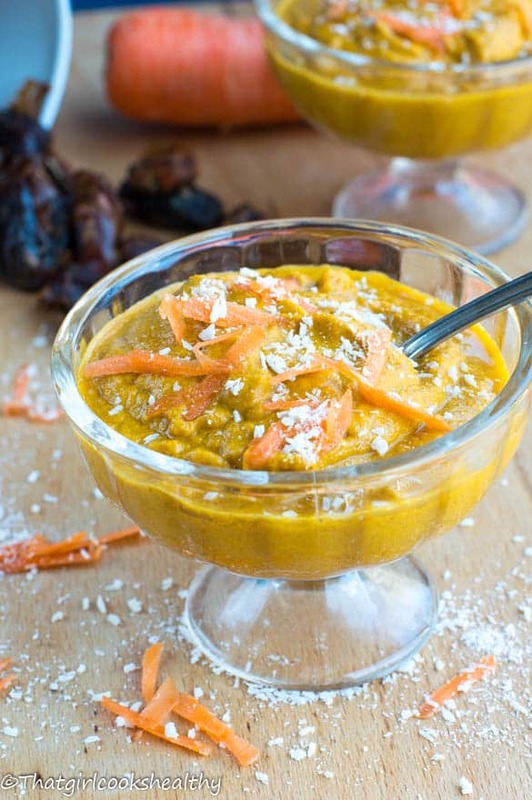 Raw creamy carrot dessert recipe – a delicious no bake dessert made from grated carrots, dates, ginger, nut butter, nutmeg and cinnamon. I think the best thing about cooking is the experimenting aspect of it, c’mon am I the only that loves diving into the kitchen and exploring something new? I’m sure I am not alone with this one. Anyway, I had a large bag of unused carrots on my vegetable trolley; they’d been sitting there for a number of days now. I do recall looking at them before I went to work on Friday and saying to myself, I must improvise with that little bundle of orange on the weekend. 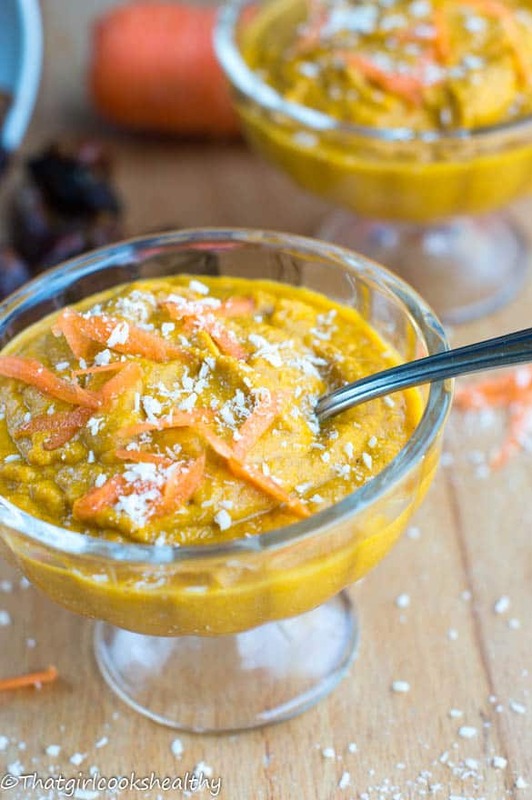 Moving on to the weekend, I envisioned a creamy carrot dessert recipe. In short, when I made this creamy carrot dessert recipe, honestly the results were divine. I had a few relatives sample the end result and ended up requesting more. I’m pleased with this recipe because it draws upon my Caribbean lineage – with nutmeg, cinnamon and ginger being the star of the show. I added some peanut butter to capitalise on the creaminess which worked and the dates gave a subtle sweetness. The thing I liked about this dessert was the rich texture combined with a subtle element of sweetness. 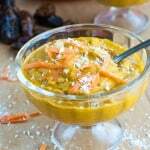 Whether you’re vegan, rawist or a carnivore I’m sure you will like this vitamin A enriched treat. Add the water to the blender accompanied by the rest of the ingredients and blend until a creamy texture begins to form. I made this dessert last night – it’s also a winner! This was another winner! I love carrots and totally enjoyed this dessert. Hi Ceil. Glad you enjoyed the recipe. I use a Vitamix which is a high powered blender which breaks down the ingredients with ease. Not sure what blender you have but if it’s not the latter that may explain the additional use of water. about the Vitamix, but haven’t invested in one as yet because I’m still bouncing around the globe. I’m however, looking forward to making this investment when I return to the USA. Please do! It’s costly but worth every single penny. There’s not a day that goes by where I don’t use my Vitamix, it’s so powerful and blitz everything within a matter of seconds.